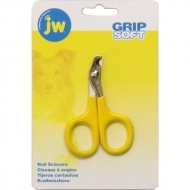 JW Pet Grip Soft Small Nail Clipper is an extra small clipper designed for use on small breeds of dog, birds, cats and reptiles. This versatile clipper is safe and easy to use with it's non-slip grip soft handle. TropiClean Berry Breeze Deodorizing Pet Spray is sporting a new style, so you may remember it as our Berry Fresh pet cologne. Berry Breeze Pet Spray adds extra freshness to your pet’s coat after bathing or between baths. In addition to giving your pet a signature scent with a tropical fragrance that lasts for days, Berry Breeze conditions your pet’s coat and reduces static. Berry Fresh helps your pet look and smell like they’ve just been bathed. Make your furbaby smell baby-powder-fresh with this soft and light fragrance. 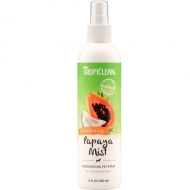 TropiClean Baby Powder Pet Spray adds extra freshness after bathing or between baths. Spray on your pet’s coat to condition their fur while reducing static. The long-lasting fresh scent lasts for days, so your pet looks and smells like they’ve just been bathed. For use on dogs, cats, ferrets, hamsters, rabbits, and other small animals. 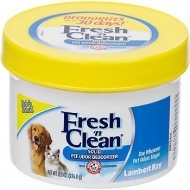 Fresh 'n Clean® Solid Pet Odor Deodorizer is a solid air freshener and deodorizer for any room in your home. Safe for use around pets, beacuse it is a solid pet odor deodorizer, there's no worries about spills. It's effective for removing any unpleasant odors around home or in your vehicle. Lasts up to 30 days and deodorizes approximately 150-200 sq.ft. Dissolves organic matter from pet accidents, blood, food and beverages quickly and easily. The biodegradable formula will not harm or discolor carpets or upholstery. Will not irritate sensitive skin, eyes or noses. Easy to use and requires no rinsing. Smells & Stains uses a broad spectrum of natural enzymes and co-enzymes to break down the toughest stains and odors completely. 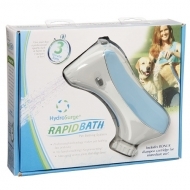 It dissolves organic matter from pet accidents, blood, urine, food and beverages quickly and easily. 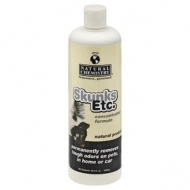 This natural, biodegradable formula will not harm most carpets or upholstery, or irritate sensitive skin. Smells & Stains is easy to use and requires no rinsing! 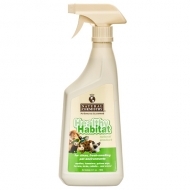 Natural Chemistry Healthy Habitat is specifically formulated to effectively eliminate odors and soiling caused by organic animal and food waste using only safe, natural enzymes and no harsh chemicals. 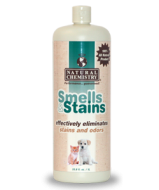 Safe for use on all strong animal/reptile odor sources and stains. That means it's great for reptiles, hamsters, guinea pigs, ferrets, birds, rabbits, and more. It can even be used when your pet is in its habitat! It's safe for use in any pet home, or on any glass or other surfaces within the habitat, including heat rocks, gravel, artificial plants, etc. These are all-purpose formulas that deodorize and clean.